New research shows that honey bees forage for a diet that balances their colony’s specific nutritional deficits. While pesticides and pathogens pose clear threats to honey bee health, the need of bee colonies for balanced nutrition is gaining increasing appreciation. 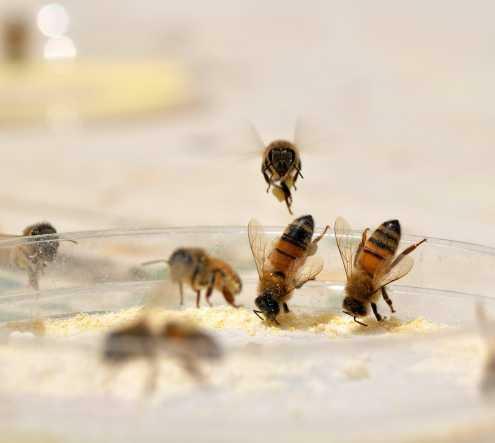 As colonies are kept in agricultural areas for crop pollination, they may encounter nutritional deficits when foraging predominantly on one pollen source. In California almond orchards for instance, 1.6 million colonies are kept every year, despite the risk of low floral diversity, which can reduce the life expectancy of bees.In light of the challenge that agricultural intensification poses for pollinator habitats, Dr. Harmen Hendriksma and Prof. Sharoni Shafir from the Hebrew University of Jerusalem report that honey bee colonies are astoundingly resilient to nutritional stress. In new research reported in the journal Behavioral Ecology and Sociobiology, they found that bees can shift their foraging effort towards resources that complement nutritional deficits.The research was conducted at the B. Triwaks Bee Research Center, Department of Entomology, The Robert H. Smith Faculty of Agriculture, Food and Environment, at the Hebrew University of Jerusalem. This result indicates that honey bee colonies not only attempt to diversify their diet, but that they bias their foraging effort towards a diet that specifically balances nutritional deficits of the colony. How bees perceive and evaluate nutrient composition needs further elucidation. This new-found ability of honey bees to counter deficient nutrition contributes to mechanisms that social insects use to sustain homeostasis at the colony level.“This research indicates that honey bee colonies strive to balance their nutrition if appropriate floral resources are available. Bee colonies can benefit by this type of resilience when food options are sparse, for instance at certain sites or in seasons of dearth. Since alternative floral resources can help bees to balance their nutritional needs, this should serve as an incentive for everyone to plant flowers, wherever and whenever they can,” said Dr. Harmen Hendriksma.“Our research with bees continues to reveal their remarkable abilities. Honey bee colonies must maintain a balanced diet for optimal health, and bee foragers seem to have evolved the sophisticated ability to bias their efforts towards finding food that balances the colony’s nutritional deficiencies. In so doing they remind us that in nutrition, as in many other things, maintaining the proper balance is key,” said Prof. Sharoni Shafir.